We are so excited to announce that we have added new beneficial data to our Reports! At Environmental Record Search, we strive to provide the best products and services we possibly can. We see how we can make our reports more user-friendly and comprehensive to help save you time and money. We will now be including a Potential Plumes/Areas of Concern/Contamination Map and an ASTM/AAI Standards Summary Checklist. 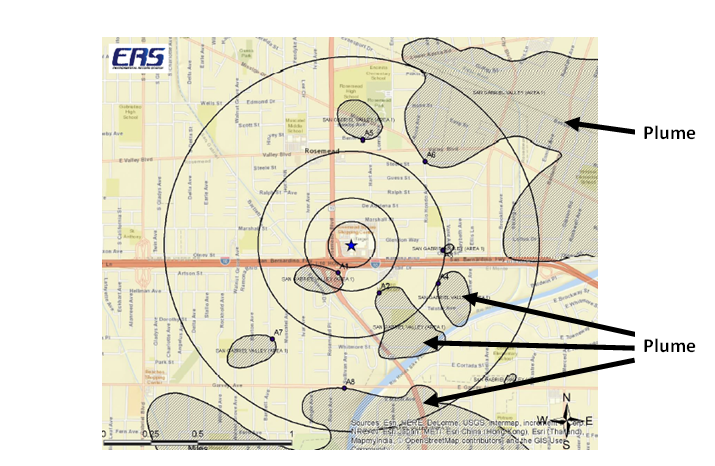 All RecCheck Reports (1-mile radius search report) will include an additional Map (labeled as Map 6) in the report that will show the Potential Plumes/Areas of Concern/Contamination. This additional data will help you better determine the risk to your subject site. The Map will only be included if it is applicable to your site within the distance search. The map is labeled Potential Areas of Concern/Contamination. You can easily access this map in the report using the hyperlinks on the Table of Contents page or via the bookmarks icon and then selecting on the bookmark labeled Potential Areas of Concern/Contamination Map. If you need assistance locating the bookmarks, contact us at (800) 377-2430 and we will be happy to help and go over the layout of the report with you. The legend on the map will indicate which Potential Plume/Area of Concern/Contamination corresponds to a particular Database. We have also indicated on the map the closest point to the subject site within each Potential Plume/Area of Concern/Contamination. These points will be labeled as A1, A2, A3, etc. Like any other Database listing in the Report, each Potential Plume/Area of Concern/Contamination will have its own details listing. These listing details can be easily located in the bookmarks (if report is in PDF format) as MapID_ A1, MapID_A2, etc. For your convenience, these bookmarks will now also include the Database name at the end of the Bookmark name. 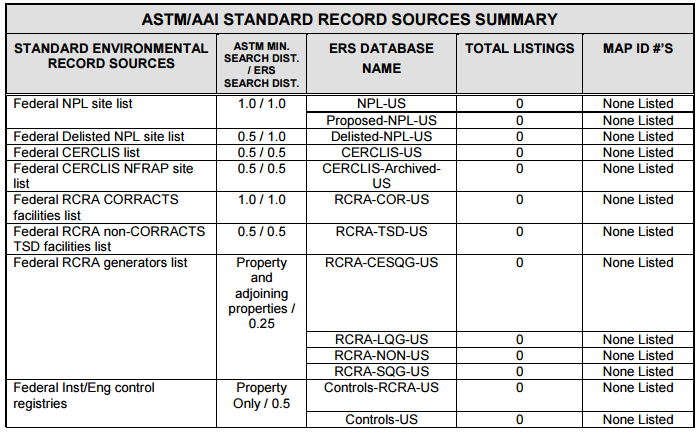 For your convenience, we are now including in our Radius Search Reports an ASTM/AAI Standards Summary Checklist meant for Phase I ESA’s and TSA’s. The checklist will help you easily locate the total number of listings and easily click through to the corresponding Map ID via a hyperlink. You can even copy and paste the ASTM/AAI Standards Summary Checklist into your report, saving you time and money. If you have any questions or comments regarding the New Additions to our Radius Search Report, please let us know. We are here to help! For a SAMPLE RECCHECK REPORT with the Potential Areas of Concern/Contamination Map and the ASTM/AAI Standards Summary Checklist, send an email to Susanal@reccheck.com TODAY! ←ERS is the ONLY company REDUCING your Environmental Risk and Liability!! Don’t pay more for less!